If you’ve ridden BART his month, there’s a decent chance you spotted a new ad that’s meant to prick the conscience: an image of happy piglets frolicking in an open field juxtaposed with a shot of a few sickly-looking pigs locked up in cages. 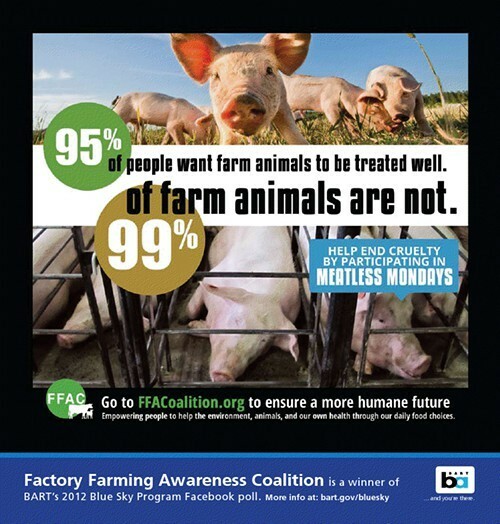 The ad was created by the Berkeley-based Factory Farming Awareness Coalition (FFAC), the organization that received the second most votes in a Facebook poll sponsored by BART’s sustainability-focused Blue Sky Program this past spring. The top three vote-getters, in a lineup of local nonprofits, got a month’s worth of free advertising: 120 ads aboard the BART trains themselves and another 40 spread across the various stations. Katie Cantrell, a UC Berkeley grad who founded the Factory Farming Awareness Coalition two years ago, explained that the organization’s focus is on educating the public about all of the negative impacts of factory farming — on animals, on workers, on the environment, on people’s health, and so forth. Ultimately, the group’s fifty-plus members decided that encouraging people to abstain from meat on Mondays would be a way to empower participants to make a difference in all of those areas — hence the selection of that theme for the ad campaign. “It’s just a great and easy way for people to actually take action,” Cantrell said. The national campaign for Meatless Mondays was started in 2003 by the Johns Hopkins-based Center for a Liveable Future. The focus of the initial campaign was on reducing meat consumption primarily as a matter of public health, but over the years many organizations have promoted the idea from a number of different angles — the effect that eating less meat would have on the welfare of farm animals, for instance. 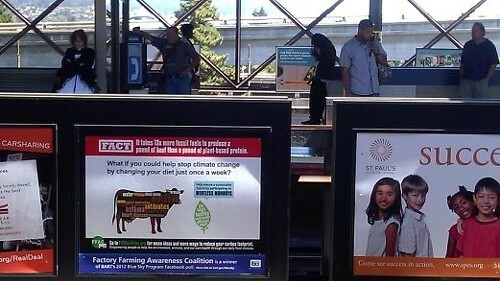 According to Cantrell, the statistics cited in the BART ad are based on a 2007 nationwide phone survey on consumer preferences for farm animal welfare (for the 95% figure) and an examination of the 2002 USDA Census of Agriculture results by the Farm Forward advocacy group (resulting in the 99% calculation). Cantrell said both ads should stay up through the first week of October. Additional information about Meatless Mondays, including links to a variety of meat-free recipes, is available on the Factory Farming Awareness Coalition website.